SEVIERVILLE, TENNESSEE - The Tennessee Smokies beat the Pensacola Blue Wahoos 3-2 on Friday night at Smokies Stadium. A walk-off hit by pitch in the bottom of the tenth inning ended the game. Tennessee jumped out to an early lead in the first inning. Zack Short led off the inning with a double and Trent Giambrone followed with a single, moving Short to third. Jeffrey Baez drove in Short with an RBI-single to make it 1-0 Smokies. Pensacola used an RBI-single in the fourth inning to tie the game at 1-1. The game would remain tied through nine innings. Pensacola took the lead in the tenth inning on an error, making it 2-1 Blue Wahoos. Vimael Machin got on base with a one-out single in the bottom of the frame, moving ghost-runner Eddy Martinez to third. Tyler Alamo followed with a walk, loading the bases. Wynton Bernard would draw a walk of his own, scoring Martinez and making it 2-2. With two outs and the bases still loaded, Short was hit by a pitch to score Machin and give the Smokies a 3-2 victory. Justin Steele started on the mound for Tennessee. Steele pitched 6.0 innings, allowing one run on three hits and one walk. He also struck out five in his first home start of the season. Steele was relieved by Daury Torrez to start the seventh inning. Torrez threw 2.0 innings, giving up one hit and one walk while striking out two. He was relieved by Wyatt Short to start the ninth. Short pitched 2.0 innings, allowing one run while striking out one. He did not allow a hit or a walk, as the run scored on an error. 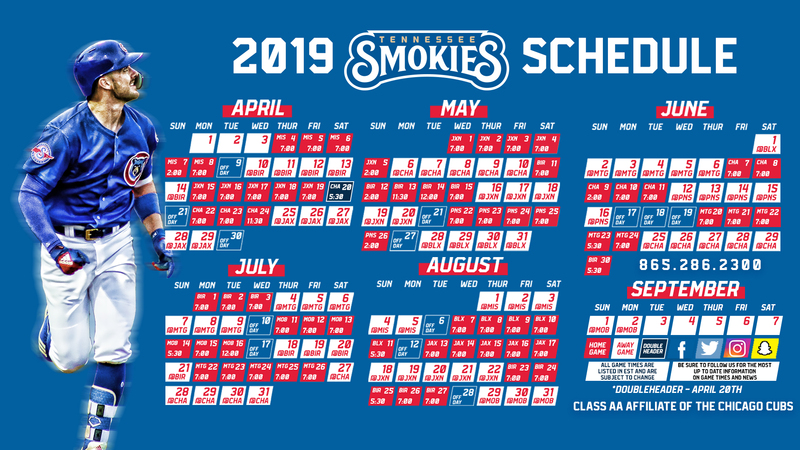 Tennessee and Pensacola will meet for the third game of the series on Saturday at 7:00 p.m. Thomas Hatch (8-6, 3.72 ERA) is projected to start on the mound for the Smokies and Tony Santillan (4-3, 3.49 ERA) will start for the Blue Wahoos. Hatch gave up three runs in 4.2 innings in his last start on Aug. 26. He is holding batters to a .210 average in the month of August.